Drill-paths are used in Metrics to guide a User to either a Report that provides more details on a specific data point or to some other related element needed for the further data analysis. Drill-paths are defined in the Metric Editor - Associations tab. This article covers the Setup process for both drill-path options. 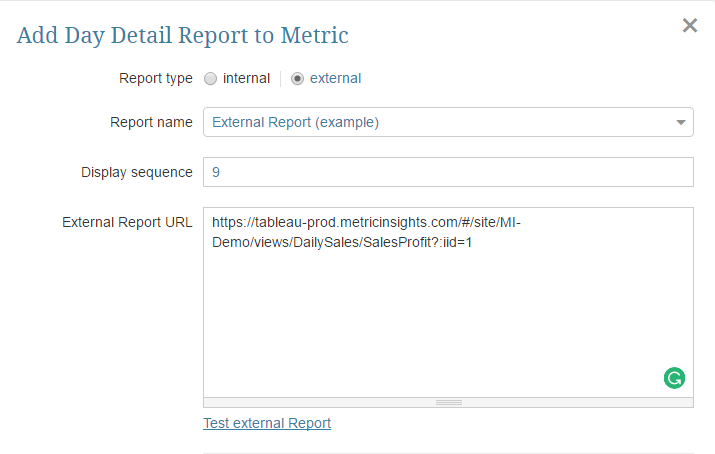 Day Detail: is used when you are providing a Report that shows additional details for a specific data point in a Metric. 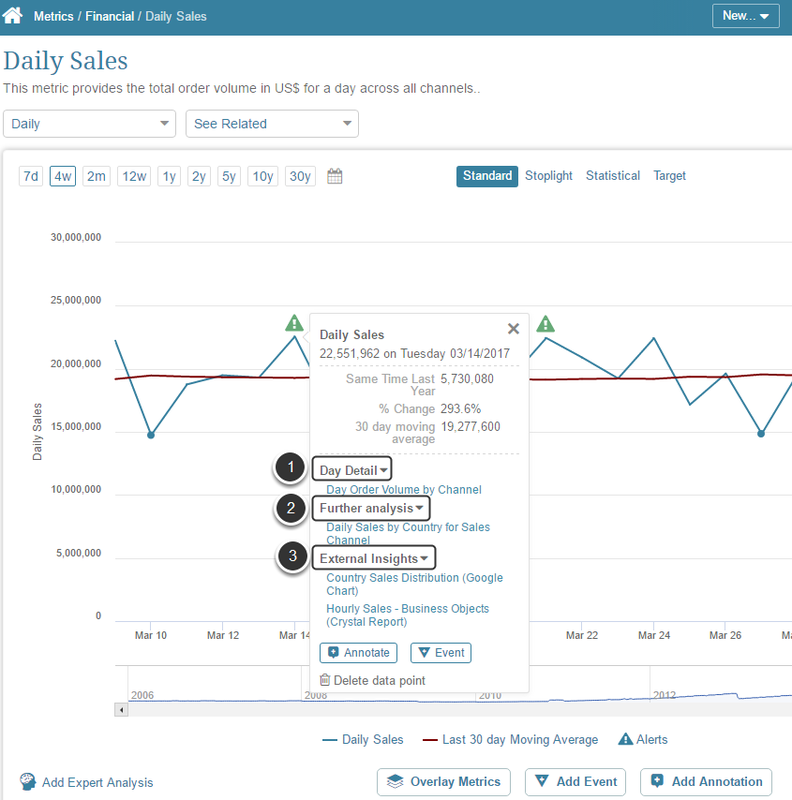 For example, you may have a Daily Sales Metric where you want to show the details on products sold on a given day, such as which number of units sold. Further analysis: is used when you are providing an Element that shows additional details for a specific data point in a Metric. For example, you may have a Metric where you want to provide details on subcategory products sold on a given day. 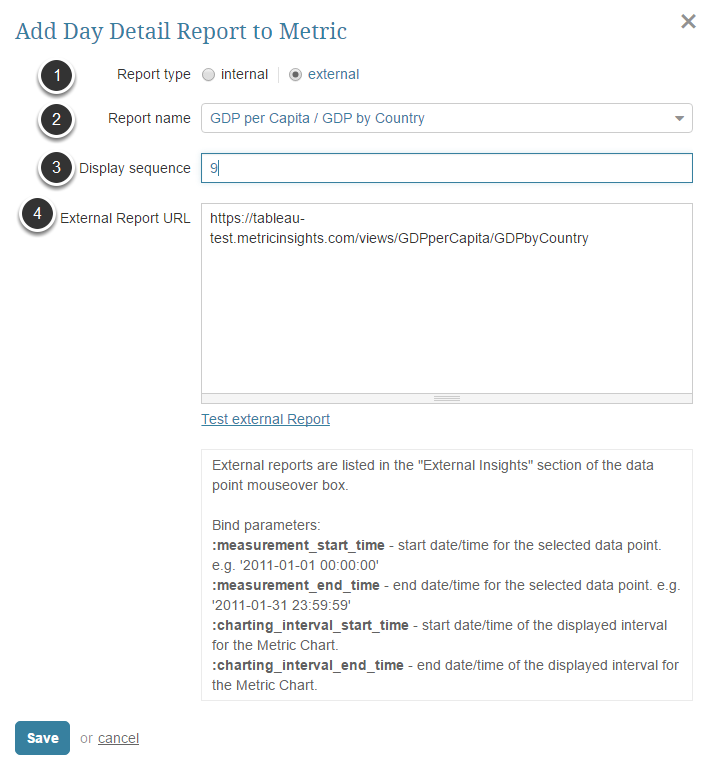 External Insights: is used to add path to External Reports that may have insights on data in this Metric. Follow this article to see how to add elements to these sections in Drill-downs. This title of this grid is set based on the Measurement Interval of the Metric. For instance, it will be titled 'Week Detail Reports' for weekly Metrics or 'Month Detail Report' for monthly Metrics. To add a new Report to the drill-path, click [+ New Report]. To add a new Element suggested for the Further Analysis, click [+ New element] below the Elements for Further Analysis table. The Add an Element for Further Analysis pop-up opens. External Insights (links to External Reports) are also added below the <Measurement Interval> Detail Reports table. Report name: Select an External Report to be added to a drill-path from the drop-down list. If you scroll down to the bottom of the drop-down list, you can create a new External Report on the fly. 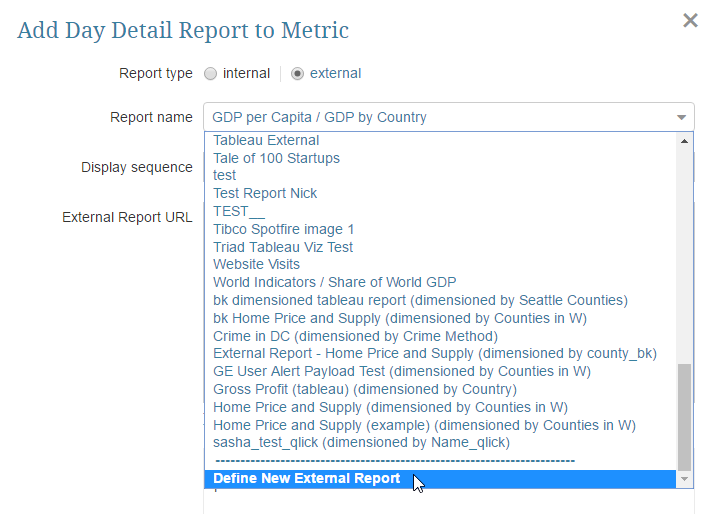 If you want to add a new link to some external resource to the Drill-down path, scroll down to the bottom of the drop-down list, and click Define New External Report. 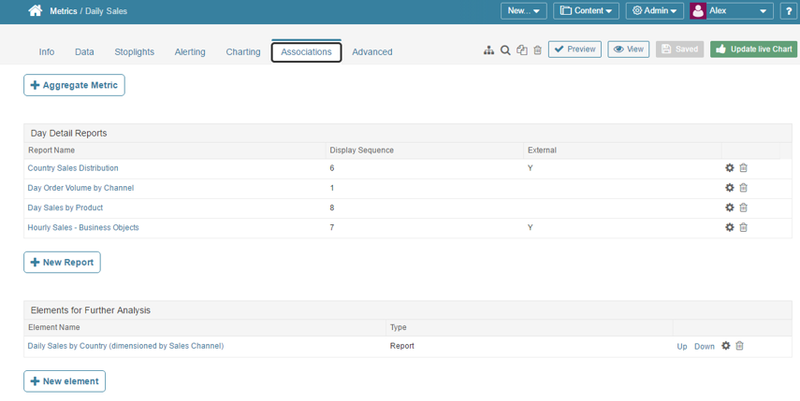 When creating a new External Report on the fly, you are choosing its Report Type from the drop-down list. NOTE: If the required Report Type is not in the list, go to Admin > Advanced > External Report Types > choose the required Report Type from the list and in the Report Type Editor make sure that Can be auto-created from Drill-Down field is set to 'yes'. 5.2. Add a link to a Report and Save your Entries. The link to this External Report is going to be shown in the Data Point Mouse-over Display > External Insights.